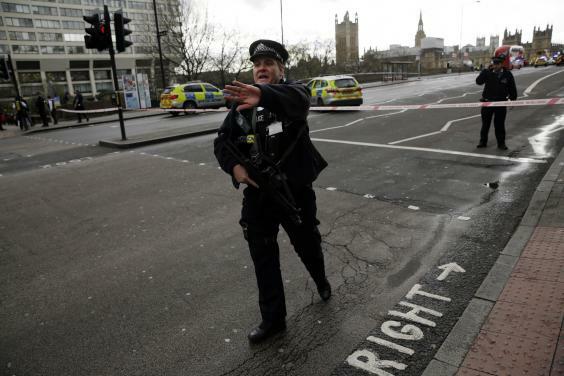 The terrorist attack in and around Parliament today, where four people died, including the attacker and an unarmed police officer, with forty injured, some seriously, has brought a strange mood to the city. I work in Westminster, and our building, along with many others was in lockdown this afternoon. We were finally allowed to leave the building at 4.45 pm, but told to 'disperse' quickly. The area was much quieter than normal at rush hour as I made my way home, with large sections of Whitehall and around Parliament Square roped off by the police, and police and security vehicles sirens continually blaring as a backdrop. The mood reminded me of the 2005 tube bombing in London, which carried on for weeks. The attack came exactly one year to the day after the Brussels underground attack, and is being treated by police as a terrorist incident, which seems to be the case. I've been thinking, with all of these terror attacks in Europe, in France and Germany mainly, there was sure to be an attack on London at some stage. Today it happened. It bore similarities with the vehicle attack in Nice in France, and the knife wielding ones in Germany, in fact it was a combination of the two. These 'lone wolf' type of attacks are very difficult to prevent. How you know what is going on in one person's mind? You can't, you can only prepare a response, and the security services do look to have responded quickly and efficiently to it. With these type of events, if you are in the wrong place at the wrong time you are unlucky, it is unfortunately a fact of modern life, but it isn't so easy to be philosophical about that. I've been inside Parliament myself, and the police look like Robo Cops, very heavily armed, but somehow it does not make you feel safer, it kind of makes you nervous. It is though necessary, unfortunately, as today's events demonstrate, though 'softer' targets are impossible to protect. Parliament and its surrounds is the most protected area in the country, and it happened there. Life carries on, I suppose, but the city has taken a big knock today. Thoughts with those affected and their friends and family, a dreadful day in London.